These new three-phase battery chargers with CANBUS interface represents the latest innovation in ZIVAN's product range. Thanks to a "flash" microprocessor endowing with high calculation power and huge storage capacity it is able to view in historical perspective the main data concerning the last charge cycles, elevating its feasibility and performance. By a sole button it is easy to modify the charging features, visualize them on the display and fit them to any type of battery. 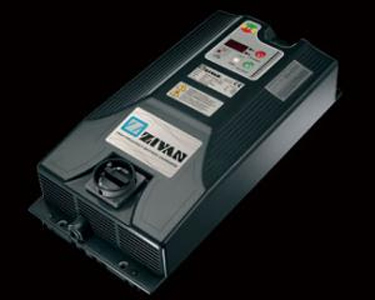 The high power and efficiency of these ZIVAN chargers guarantee a significant energy savings and subsequent economic advantage. This allows for a short return-on-investment in choosing these high frequency chargers, ranking them among the leading units available on the market with the best relationship between quality and price.